This summer I signed the girls up for a pottery class through the UVU extension. They had 3 classes where they made 3D animals. The last class they got to glaze everything. We haven't picked up the finished projects yet. Probably sometime next week. The girls had so much fun at this class. 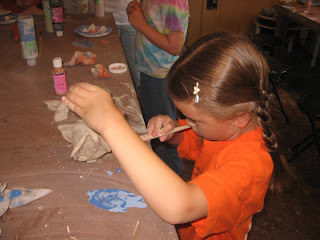 Valerie, of course, wants to be a potter when she grows up (a goal for at least the last 4 years). She is excited for when she can do wheel turned pottery classes, and the teacher said she could teach wheel classes whenever we want to call her to sign up. So I guess we will have to do it soon. The other girls just naturally want to do what Valerie wants to do, so they love it as well. 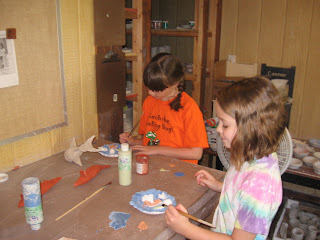 In the pictures you can see the fish, alligators and "sea bowls" the girls are working on painting. I can't wait to see the finished products. The kids got passes to Classic Skating from the Public Library reading program this summer, so we went skating. 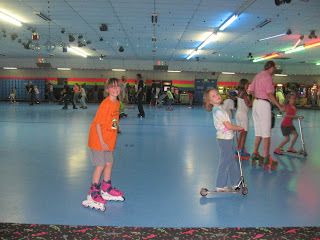 Valerie is getting much better with the in line skates. Scarlett traded off from her scooter to her regular skates, and Ella used regular skates as well. Dante rode up a storm on his scooter when not trying to play the video games. It was a pretty fun night. We have managed to keep really busy this summer and I can't believe that school starts in less than 2 weeks. Time goes by so fast. On Pioneer Day weekend, our family took a trip to St. George, UT. Even though it was hot, it was a lot of fun. One of the missionaries at the visitor's center at the St. George temple told us that even though it was around 106 degrees down there, it was 101 in Salt Lake, so the difference wasn't that bad. We went swimming every day while we were there. There were two pool areas at the resort. One had a little waterfall. We took advantage of the gas grill on our balcony. We made shish kabobs with beef, shrimp, onions, grape tomatoes, mushrooms and bell peppers. We stopped by Cove Fort on the way down. The kids really enjoyed it and the kids got one of those toys with a disk and string that you spin around. While in St. George we saw Brigham Young's winter house and Jacob Hamblin's home. 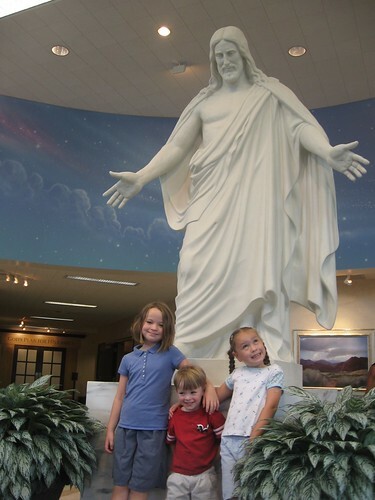 The tour had lots of historical facts about who made the chairs and Brigham Young's favorite kind of pie. I would have liked a little more church history thrown in there. 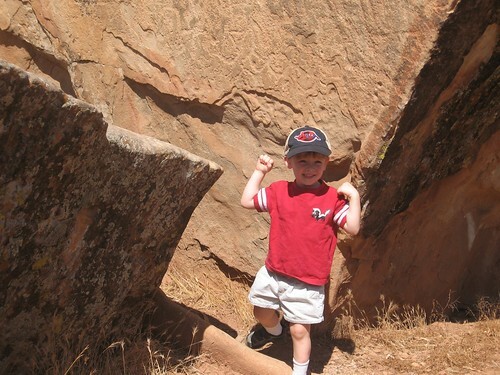 We saw some petroglyphs on Friday. They were in this tiny park in a residential area of town. We accidentally drove right by it at first because the park was so small. After that, we went to the Dinosaur Discovery Site at Johnson Farm. 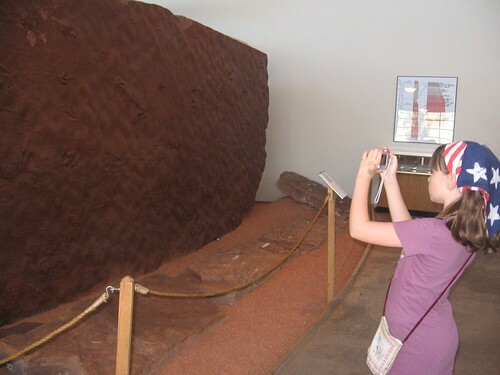 It's a museum that was built around a site where a bunch of fossilized dinosaur tracks were found. 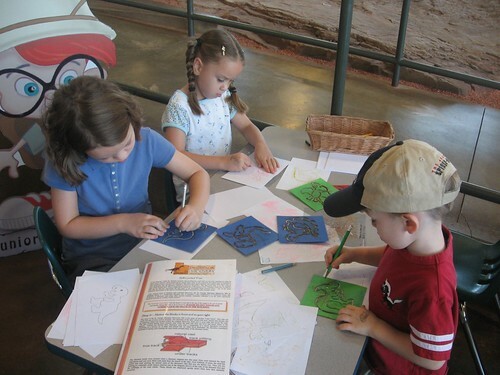 After looking at the different footprints, the kids did some coloring, stencils, and rubbing imprints. I was working on a new prop this weekend. I bought a 2-part witch mask in a group buy a few months ago because I wanted to make it into a witch prop for our porch. This weekend I combined it with some hot glue and aluminum foil (for the structure of the head), the mechanism from a talking Douglas Fir tree and life-sized doll eyes. The video shows my progress so far. I'll try to do an update about our trip to St. George on Pioneer Day weekend if Becky doesn't get to it first.